Botanical Name: 1. Amomum vilosum Lour. ; 2. Amomum longiligulare T. L. Wu; 3. A. xanthioides Wall. Part Used & Method for Pharmaceutical Preparations: The fruit is gathered in summer or autumn, whenever it ripens. It is dried in the sun or in a low-temperature room and then mashed. 1. Dampness blocking spleen and stomach or qi stagnation in the spleen manifested as distension and pain, no appetite, vomiting, nausea and diarrhea: Amomum fruit (Sharen) is used with Atractylodes rhizome (Cangzhu), Round cardamom seed (Baidoukou) and Magnolia bark (Houpo) for cases of dampness blocking the spleen and stomach. Amomum fruit (Sharen), Costus root (Muxiang) and Immature bitter orange (Zhishi) in the formula Xiang Sha Zhi Shu Wan are used for cases of qi stagnation due to retention of food. 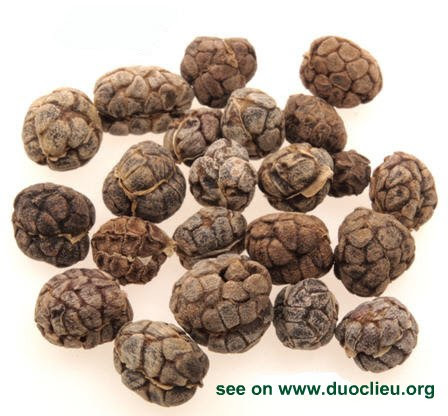 Amomum fruit (Sharen), Tangerine peel (Chenpi), Pilose asiabell root (Dangshen) and White atractylodes (Baizhu) in the formula Xiang Sha Liujunzi Wan are used for qi stagnation caused by weakness of the spleen. 2. Morning sickness or restless fetus: Amomum fruit (Sharen) is used with White atractylodes (Baizhu) and Perilla stem (Sugeng). The shell of Amomum fruit (Sharen) has similar properties and functions to the Amomum fruit (Sharen), however, the warming property of Amomum shell (Sharenqiao) is less strong and its ability to transform dampness and promote circulation of qi is weaker. This herb is indicated in qi stagnation in the spleen and stomach, epigastric and abdominal distension and fullness, nausea, vomiting and poor appetite.